Holiday illustrations by Ellen H. Clapsaddle are among my favorites. They often feature cute, fresh-faced children interacting with icons of the holiday. 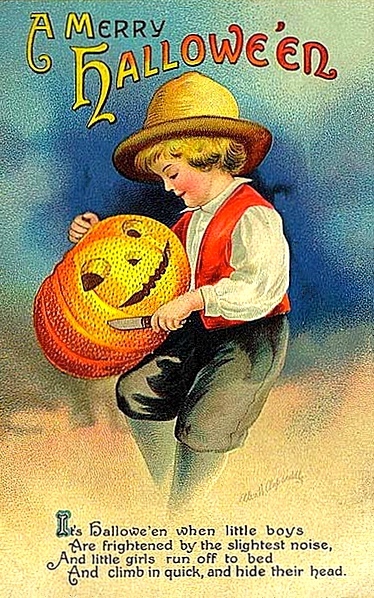 In this example, we have a cute little boy carving a pumpkin into a jack-o-lantern. Clapsaddle was one of the many artists who were illustrating postcards in the early part of the 20th Century. Clapsaddle’s work has become a favorite of vintage postcard collectors as well as mixed media artists looking for bright and vivid holiday images to incorporate into their own work. And climb in quick, and hide their head.